Fiercely spiritual and reclusive, Shamans practice the art of Curses, through which they can hex their opponents with a number of debilitating afflictions, bind their souls with spirits long past via Spiritlore, and utilise the terrifying dolls crafted by their Vodun mastery. The enigmatic ritualists called Shamans hail from the wintry northernlands of Hashan. The class was born in 288 A.F. of the modern age, when Firefox Sly opened the guild of Shamans to the world. Drawing their strength from the darker side of mysticism, the class of Shamans is not inherently aligned with any ethos. However, they tend to draw those who embrace the secrets of the shadows more readily than the light. Forsaking their ties to the earthen magics, Shamans embrace the power of Spiritlore, allowing them to seek out and bind long-lost spirits into their body. These spirits grant a multitude of new powers, as well as augment their existing abilities in Vodun and Curses. Upon entering a trance, practitioners of Spiritlore may bind the spirits of one or more ancient spirits to them, augmenting the Shaman's already impressive arsenal of abilities with new features. Additionally, one may choose to further attune oneself with a particular spirit and unlock even greater powers. The most skilled practitioners are even rumoured to be able to attune themselves with multiple spirits, or even of being able to sever their spirit from their body and traverse incorporeally. Commune Commune with the spirits. Aspar Aspar, The Iron Handed. Designate Designate the owners of your tribal totems. Tether Desperate times lead to temporary measures. Spiritwalk Walk free of the confines of mortal flesh. Mastery Mastery of the spiritual arts. 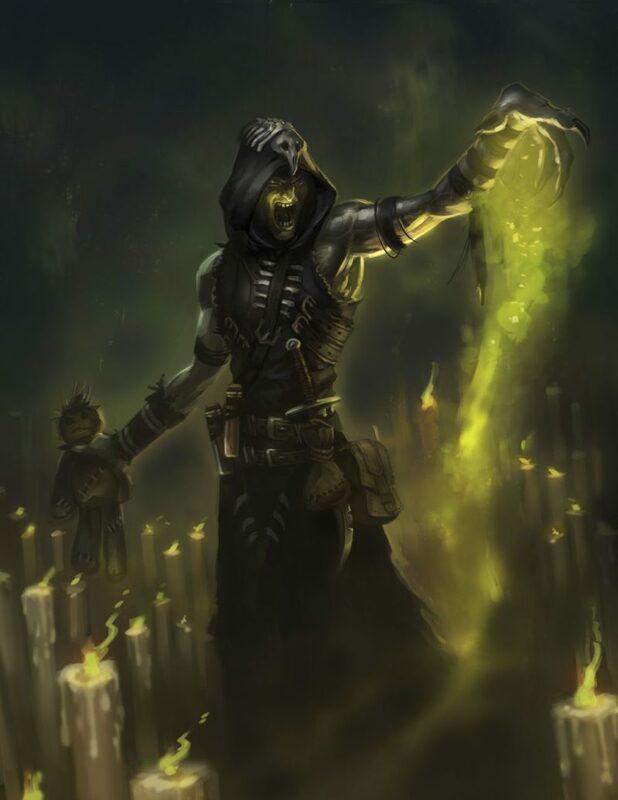 Curses draws on the dark side of the mystic world for its power. It is a simple, yet powerful and deadly skill, allowing one to reel off curse after curse in quick and deadly succession. The curses available range from epilepsy to vertigo to the voyria plague. Discernment Discern the severity of your victim's wounds. Truecurse The ability to drive your curses through magic shields. Manaleech Cause the victim's mana to bleed away. Paralyse Freeze the limbs of your enemy. Swiftcurse The ability to deliver curses much more quickly. Healthleech A victim's health will slowly bleed away. Haemophilia Deny them respite from their wounds. 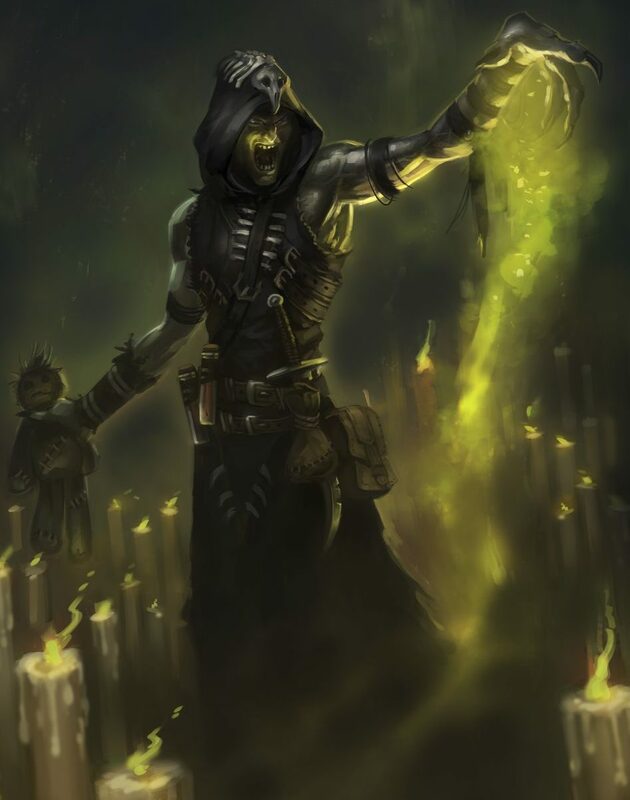 Blight The most feared of the Curse abilities. Inflame Set a victim's very blood aflame. Tzantza Bring a most painful end to your victim. Jinx The ultimate shamanic curse. The skill of Vodun is a mystical one. By using an empathetic link to imbue a carving of someone with life energy, you can affect that person from afar. Powerful Vodun masters are rumoured to be able to do anything from confusing people from afar, to leeching life experiences away from them, to slaying them from afar. If someone obtains a doll of you, then you must either obtain the doll and destroy it, or slay the Vodun master that created it. Fashion Fashion vodun dolls from rope and cloth. Gripping Grip your dolls tighter than ever before. Confusion Muddle the thoughts of your victim. Dizzy Cause your enemy to become unsteady on his feet. Sleep Send someone to the dreamworld. Illusion Cause your victim to see an image of your choosing. Spy See the surroundings of your target. Status Find out what the health and mana of your target is. Paralyse Lock up the muscle system of your victim. Break Break both the arms or both the legs of someone. Throttle Crush the life out of your victim. Reckless Induce a sense of extreme bravado in your opponent. Tickle Tickle the feet of your doll. Burn Set your victim alight. Travel Travel through the spirit pathways to your doll. Cripple Break all the limbs of a victim. Command Your wish is their command. Slow Make a victim move through time more slowly. Puncture Destroy your target's internal organs. Blackout Rob your victim of some of his senses. Summon Summon your victim to you. Bind Tie up your hapless opponent. Listen Hear talking through your target's ears. Inventory See the inventory of your target. Imbibe Afflict your opponent through your doll. Mangle A pain beyond that of mere breaking. Concussion Bruise the very brain of your doll's model. Leech Attach yourself to the spirit of your victim. Truefashion The hallmark of a master of Vodun.